Among CCS options for coal, pressurised oxycombustion (ie, combustion of coal with oxygen at pressurised conditions) appears to promise the best overall efficiency for power production, around 34% (HHV basis). However, the idea has been pretty much wishful thinking up to now, with efforts focused on the (much easier in principle) technology of atmospheric-pressure oxycombustion. This has proved challenging enough, with severe problems arising from corrosion, erosion, fly ash clogging, etc. With higher pressures these concerns escalate, so much so that none of the big technology players has initiated any tangible development effort on pressurised oxycombustion to date. However, for some years the technology has been under development by ITEA, a small combustion R&D company within the Italian Sofinter-AnsaldoCaldaie-Macchi Group. In 2004 ITEA introduced a new concept, which it called flameless pressurised oxycombustion (FPOC). FPOC represents an innovative combination of combustion parameters, including some historically neglected features, capable of achieving a huge leap forward in terms of inherent emissions characteristics. In a single combustor, and for every fuel type (solid, liquid, gas), it eliminates a wide range of problematic combustion byproducts, such as dioxins, hydrogenated polyaromatics, soot, NOx, CO, SO3, as well as fly and heavy ashes. Even more remarkable, the ashes are segregated at the combustor bottom as zero-carbon vitrified slag, posing no risk of heavy metal migration, thus constituting a zero-leaching fully inert byproduct. Initially, ITEA's efforts were focused on the incineration of hazardous wastes, but the potential for clean fossil fuel combustion was recognised quite early on and ENEL has supported development work on FPOC as a possible route towards "zero emissions" coal fired power production. A flame is an intrinsically "chaotic" phenomenon, a combination of catastrophic parameters (see Figure 1a). It generates locally uncontrolled conditions which can be described (and managed) only on a statistical basis, with "cold zones" (relatively speaking) and "hot spots". In the flameless concept combustion reactions are expanded to fill the entire combustor volume, which is at a high (1700 K) and uniform temperature throughout. In fact, highly effective infrared heat exchange transmission is triggered by the high temperature, while pressurised (dense) IR-opaque fumes are "forced" to co-operate in the IR heat exchange. Thus, the combustion reactions are no longer chaotic and the fumes become "transparent" (see Figure 1b). All incoming combustible species are essentially converted to CO2 and H2O only (no byproducts). Also, the high and uniform temperature means that all the ashes melt in a single process, coalesce into large droplets and drain into a quenching water bath at the bottom of the combustor, where they form vitrified "pearls" of inert slag that is non leachable. See Figure 2. ITEA has demonstrated experimentally with its 5 MWt pilot plant (see Figure 3) that the pressurised flue gas at the combustor outlet is not corrosive, erosive, or prone to particulate fouling of energy recovery equipment. Flue gas characterisation at the combustor outlet suggests that the SO3 concentration is less than 10 ppm, that the soot level is zero (non detectable), and that the residual fly ash is less than 200 mg/Nm3 (dry basis) and is in the form of spheres. The flue gas is circulated in a pressurised flue gas loop (with no sootblower needed). Experience with the pilot plant points to a process scheme (Figure 4) that is simple, readily automated, operator-friendly and compact. The only flue gas post treatment required is neutralisation of acidic compounds. "Experience to date suggests that pressurised, high efficiency, oxycombustion is no longer a technology at moon distance"
Experience to date suggests that pressurised, high efficiency, oxycombustion is no longer a technology at "moon distance", but achievable within a relatively short timeframe. On top of that, development work in co-operation with ENEL has demonstrated the following potential advantages: wide combustor operating range, from 5 to 100% combustor load at constant performance; applicability of the process to low ranking coals; reduced fire risks associated with coal milling, with the process requiring wet grinding only and no pulverisation; no emissions concerns during transients; and good operational flexibility, with less than half an hour needed to go from standby to full load (ie, the technology is applicable to daily cycling). ITEA's flameless technology is certainly a newcomer, but it has been on a rapid development trajectory, with process feasibility demonstrated in 2010. Since then the strategic approach to industrial exploitation has been matter of intense debate. The strategy for commercialisation of course needs to take on board some of the basic characteristics of the power generation technology market: high capital intensity, with capital expenditure often five times yearly revenues; typically large scale, representing a scale up of over 100 times relative to the demo facility; characterised by technologies well established for many decades, able to rely completely on OEM-guaranteed equipment and systems; tendency to be risk averse due to high capital requirements, but conversely, because of high capital demands of technology development, there is pressure to reduce the number of development steps to industrial scale, and the cost of each step. In addition, ITEA's flameless concept is highly innovative. This poses challenges for the OEM such as the need for tailor-made solutions rather than technical capabilities focused on fine-tuning super-specialist and well established technologies and the need to commit to an uncertain business. For the potential user and investor there is the problem of engendering confidence in a technology that departs radically from previous practice. On one side there were those who wanted to squeeze the commercial development cost, and time span, by reducing the number of development steps and leveraging to the maximum extent experimental data already collected, eliminating the intermediate-scale step (say 50 MWt, ten times ITEA pilot unit) and going straight to a several-hundred MWe demo unit design. On the other side were those who attached more importance to the need for experimental work, bringing on board OEMs, at around 50 MWt scale. They were concerned that OEMs would be unwilling to embark on a scale of project requiring vendor guarantees without the opportunity to familiarise themselves with the technology via "hands-on" experience with a 50 MWt pilot. Proponents of the former strategy prevailed, and a challenging detailed engineering study for a 350 MWe (net) demo unit was launched. That study has now been completed and the results have been made available. The engineering study was performed by ENEL Ingegneria e Ricerca. Among the main assumptions: the plant is located in northern Italy (Venice area); it complies with the most demanding emissions limits (airborne, liquid, solid); and it only employs OEM-guaranteed commercial equipment and systems. The engineering team concluded its project, which might be described as a true front end engineering design study, in 2013. It constitutes a detailed analysis, with more than 90% of the equipment and systems estimates supported by commercial quotations. It provides an accurate database for technology positioning and, in terms of future development, for economic assessment. The calculated overall net efficiency, 33.4% (LHV basis) puts the technology at the top of the CCS league table. The gross efficiency, 47.6%, confirms estimates for pressurised oxycombustion found in the literature. The parasitic power consumption is very high, with cryogenic oxygen production, not surprisingly, the major contributor, at 7.8 percentage points. But with improved air separation technologies currently emerging, eg the GOX cycle, a reduction to about 6.0 - 6.2 percentage points looks feasible in the near term. This of course will have an across-the-board benefit for all oxycombustion based technologies relative to post-combustion capture processes (eg, amine capture). But it still leaves the other 7 percentage points of parasitic load, which needs to be addressed. The "commercial solution only" policy leads to the deployment of a collection of "Lego-like" solutions to match the particular requirements of flameless pressurised oxycombustion. The lack of tailor made commercial solutions adversely impacts efficiency as well as capital costs. For example, the adoption of commercial systems for final purification and compression of the carbon dioxide, originally developed for "dirty" flue gases from atmospheric oxycombustion, accounts for more than 2 percentage points, which is surprising when it is considered the flameless pressurised oxycombustion process produces an exhaust gas that is already clean and pressurised. This and other departures from the optimum arising from use of commercially available rather than tailor made systems add up to produce an overall plant performance that is a long way from what the technology has the potential to deliver. Overall, it would seem possible to go below 10 percentage points of parasitic load by adopting systems tailor made and fully developed for application in flameless pressurised oxycombustion. These findings bear out the importance of having an intermediate scale pilot, which is not only a "scale up" step, but also an opportunity to work on these tailor made systems and build OEM confidence in them. The engineering study produced a capital cost estimate of 3763 euro/kWe. The total is 1.321 billion euro, of which engineering, construction and contingencies account for 276 million euro. The costs of some items are far higher than expected because they are not tailor made for the process, eg pressurised boilers and CO2 purification train. With a reasonable development effort, we expect a total reduction in capital cost of more than 200 million euro could be achieved. But this will require an intermediate scale pilot facility to be built. We are therefore launching a 50 MWt pilot initiative, which is a call to leading international OEMs to join ITEA in our pressurised flameless technology development effort. 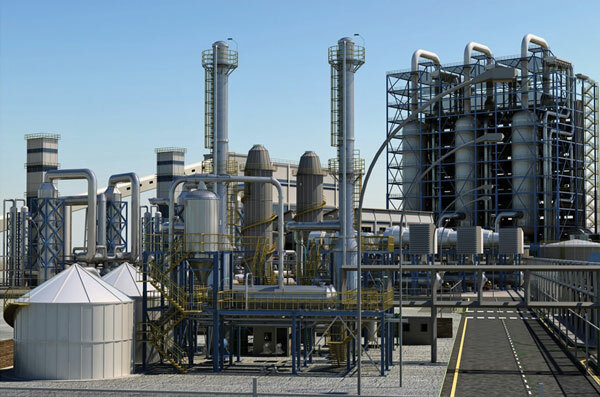 The engineering study gave an estimate for levelised cost of electricity (LCOE), and while it is competitive with comparable CCS technologies, it is significantly higher than that for a state of the art supercritical plant without CCS, of the same capacity. Thus in the absence of carbon dioxide regulation and a significant cost for CO2 emissions allowances, and uncertainties about how this will pan out in the future, how can commercial development momentum for the flameless pressurised oxycombustion concept be maintained? ITEA has been looking at developments of the technology that leverage particular strengths of the flameless pressurised oxycombustion concept already demonstrated, but without CCS. These include its inherent fuel flexibility and ability to deal with low ranking coals, promising reduced fuel costs relative to high quality coals. 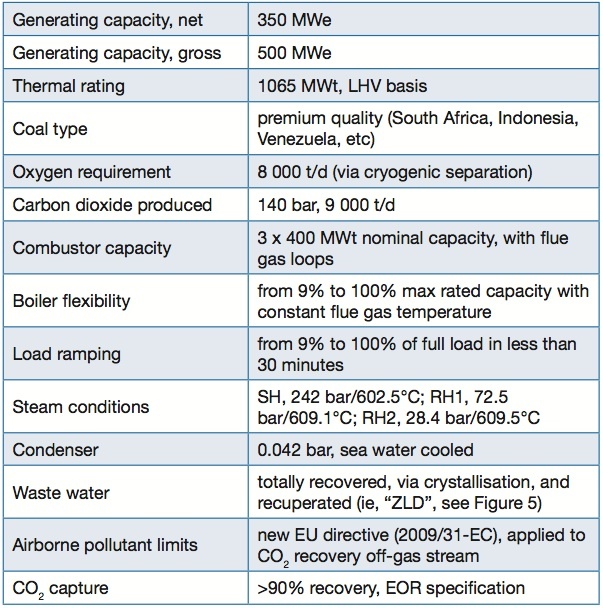 There is also scope for substantial capital cost reduction and reduced parasitic power consumption by, for example, in the case of a non-CCS version, passing the pressurised exhaust gas from the boiler through a turboexpander for increased power output while at the same time eliminating the parasitic power consumption associated with carbon dioxide purification and compression. The resulting figures are shown in the table, last column, FPOC "interim" version. 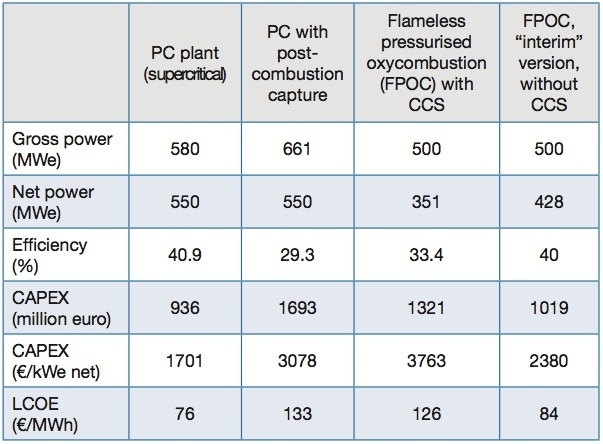 This assumes high quality fuels in each case, but if low rank coals were to be assumed for the flameless pressurised oxyfuel plant the cost of electricity figures for the FPOC "interim" version (ie, without CCS) would be less than those for the supercritical PC plant without CCS. The "interim" version of the flameless pressurised oxycombustion plant is CCS ready and can be retrofitted with a CO2 section as appropriate, and as already noted it would be highly cost competitive with other CCS options. Indeed the plant can be progressively retrofitted (step wise) as emissions regulations evolve. "ITEA's flameless pressurised oxycombustion technology has potential in other industries, notably in the oil and gas sector"
As well as power, ITEA's flameless pressurised oxycombustion technology has potential in other industries, notably in the oil and gas sector, where a potential fuel is oil heavies (rather than coal) and the carbon dioxide is used for enhanced oil recovery (EOR). ENI has supported a feasibility study by ITEA on asphaltene firing, with production of electricity, steam and CO2 for enhanced oil recovery at an oilfield. A block diagram of the process scheme is shown in Figure 6. Thanks to the flameless combustion concept, firing of asphaltene per se is not a problem for FPOC. However, heavy crudes have a high average heavy metals (vanadium and nickel) content. Vanadium oxide (V2O5) is strongly aggressive to the kinds of materials (eg, refractories, steel, alloys) typically used in conventional boilers and gasification units. Also, vanadium and nickel oxides are poisonous to humans, in addition to their environmental impact. And on top of that they are very difficult to remove from flue gases. The most common capture process consists of treating the exhaust gas with a very large amount of pulverised magnesium oxide. Unfortunately, levels remain high but corrosion problems become manageable. Airborne emissions remain of concern, as well as the disposal of byproduct magnesium sulphate and oxide. ITEA therefore conceived an innovative chemical process to convert V2O5 into inert vanadium compounds, no longer aggressive to materials, and amenable to liquid coalescence and segregation in the FPOC combustor. In fact, the conditions that prevail in flameless combustion, uniform and controllable, lend themselves to carrying out chemical reactions of this type. Extensive experience has been gained with the V2O5 process at ITEA's 5 MWt FPOC pilot unit, up to very high vanadium (5000 ppm)and nickel (2000 ppm) concentrations. Extensive characterisations of both of exhaust gases and of vitrified slags have validated the performance of the process. Plant inspections have provided evidence that corrosion is absent, in contrast with the chemical attack of materials typically encountered with conventional combustion under comparable conditions. Pilot trials with asphaltene firing have demonstrated that the resulting exhaust gases were ready for CO2 compression and condensation. ease in managing steam to power ratio. In one simple process scheme, FPOC combines conversion of heavy oil fractions into useful products with inertisation/segregation of heavy metals. The economics look sound over a broad spectrum of plant sizes, extending down to an FPOC capacity of 50 MWt. Conventional combustion is “chaotic” and not controllable at the local level, with hot and “cold” zones. Figure 6. Basic block diagram for oilfield application of flameless pressurised oxycombustion technology.